“The sculpture will be made of steel with (non-functional) oars powered by kinetic movement. 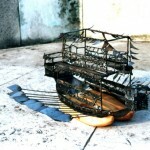 The idea is influenced by boats from the Niger Delta which are two storey dug out canoes, with bunting and outboard engines; these boats have 40 to 45 men paddling them and huge sails. Their structure has elements of the British long boats that came to get slaves and goods from Africa to take back to Europe. The long boats looked weird and wonderful to the local African people and it is this element of surprise – of an unexpected and strange floating structure – that I want to recapture. Festival Boat will be an iconic vessel. In flux on the water it will be a visual expression of the multiples of invisible, mercurial connections which exist between people, countries, time and place. Its references will be wide-ranging: Kalabari Masquerade and the celebratory festival canoes on the Nigerian Delta; European slave ships and historical trade links between the Manchester Ship Canal and the Commonwealth; contemporary issues of identity and history for British Africans and African Caribbeans; the regeneration of the Liverpool and the Salford Quays and the mutual interdependence of the cities of Manchester and Liverpool.